Cytotoxic T lymphocytes (CTL) are important destroyers of virus, recognizing MHC class I on infected cells and killing the cell before virus replication is complete. Unsurprisingly, many viruses (especially, but not only, the large and complex viruses like herpesviruses and adenoviruses) have evolved mechanisms to block MHC class I antigen processing and, therefore, T cell recognition. What has been surprising is how ineffective these viral immune evasion mechanisms seem to be. (I’ve talked about this before in a bit more detail.) In cells in the incubator (which is where most of the experiments with the antigen presentation immune evasion molecules have been done), the effects often look pretty dramatic; but when you look at the immune response in humans infected with human cytomegalovirus1 or herpes simplex virus2 (both of which have formidable immune evasion functions in tissue culture3) there are pretty hearty and effective CTL responses, suggesting that the immune evasion doesn’t work all that well in vivo. Most of the viruses that have had immune evasion genes identified are human viruses; that’s where the clinical interest and the money are. One problem with this is that the large DNA viruses that are likely to have these immune evasion functions tend to be pretty species-specific. Human herpesviruses and adenoviruses don’t infect mice well, if at all, and even if they do infect lab animals it’s not really clear how accurately this infection mimics the natural course in humans. There are a couple of lab animal herpesviruses that may be useful models (though even here the effects of immune evasion molecules are quite small.4) Still, it would be nice to understand what’s going on with immune evasion in, say, herpes simplex infection. Herpes simplex virus actually will infect mice (the alphaherpesviruses tend to be somewhat less host-restricted than the beta or gammaherpesviruses), and while mouse infection isn’t exactly like that in humans it does seem to be similar enough to offer useful insights. Not into immune evasion, though, because the immune evasion gene of herpes simplex (called “ICP47”) works very poorly in mice.5 Recently, though, Chris Wilson’s group took an ingenious approach to looking at the question, and a theme may be starting to emerge. Their latest paper10 shows something new and exciting with the recombinant virus: It reactivates better from neurons. Remember that HSV establishes a latent infection in neurons and, in humans, periodically reactivates and may shed and infect new hosts this way. HSV latency is still a mysterious and little-understood field in spite of huge amounts of work over the years, but a host of recent findings have started to explain at least bits and pieces. It used to be felt that latent HSV didn’t express any proteins, and so should be invisible to the immune system. 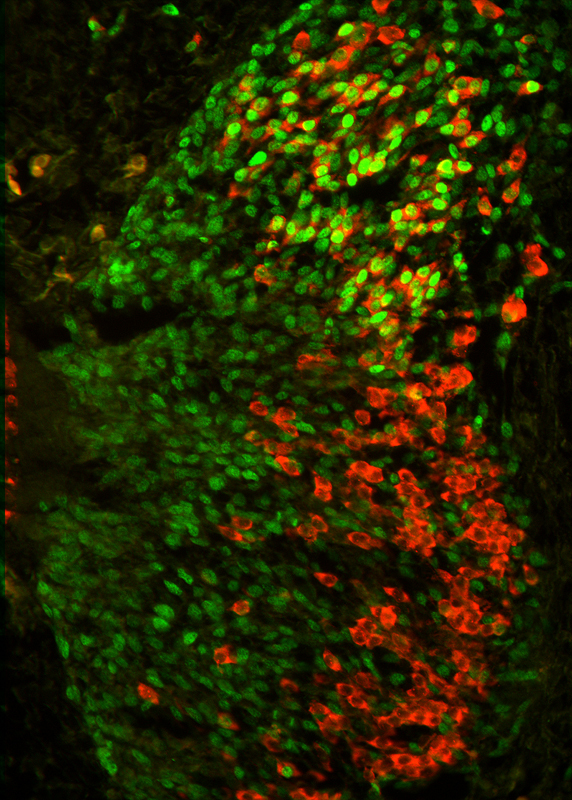 As I observed here, it’s now known that the immune system can detect HSV in neurons. That offers a mechanism for reactivation to be coupled with immune suppression. The Orr et al paper here offers more support for this concept, and suggests that one of the (most important?) 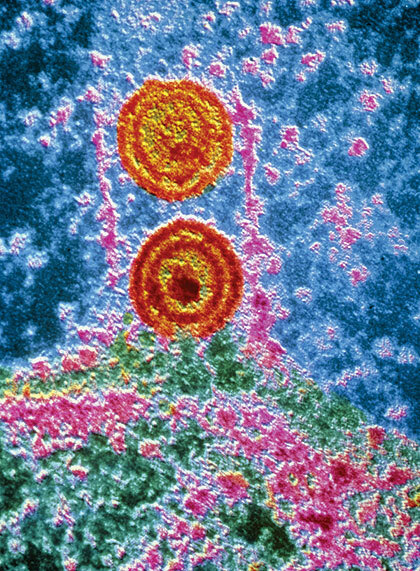 functions for HSV immune evasion is to tip the scales a little further toward the virus being able to escape recognition in the neuron, and therefore being more easily able to reactivate and infect new hosts — something this ubiquitous virus does with extraordinary efficiency. Orr et al call this an “actively testing the waters” model, in which HSV constantly sticks its toes out into the stream of the immune response to see if it’s safe to reactivate. Three data points aren’t very many, but it does suggest that this may be a common feature of the herpesviruses. Perhaps in acute infection the virus doesn’t really “want” to block immune responses all the effectively, because their lifestyle involves only a brief burst of acute infection followed by a long-term latency; and it’s that latency that allows infection of new hosts. The viruses “let” themselves be driven into apparent submission, but then use their immune evasion functions to mount intermittent stealth campaigns to recruit new hosts. If this is true for herpesviruses (and of course it’s just a hypothesis) is it also true for other viruses that have MHC class I immune evasion functions? Maybe for some (I wonder about the adenoviruses in particular, since they’re also very capable of long-term persistence in spite of immune responses) but I doubt it’s universal — HIV, for example, doesn’t obviously fit into the same lifestyle pattern as the herpesviruses, and yet if has a protein (nef) that targets MHC class I. Still, if offers a framework for thinking about the problem, which is very valuable. York, I. A., Roop, C., Andrews, D. W., Riddell, S. R., Graham, F. L., and Johnson, D. C. (1994). A cytosolic herpes simplex virus protein inhibits antigen presentation to CD8+ T lymphocytes. Cell 77, 525-535. There are a large number of home remedies for cold sores. In some cases these traditional treatments have been known to work as well as antiviral pills or numbing creams. One advantage of using a home remedy for cold sores is that treatment can begin immediately since there is no need to visit the doctor to get a prescription or go to the drugstore and choose between several creams. As soon as someone realizes they are developing a cold sore, they can begin the home remedy. Natural treatments for herpes are plentiful but many aren’t backed with any science whatsoever. The work of Dr. Otto Warbugh showed that “lack of oxygen” is the cause of cancer/sickness. Increased pH (alkalinity) and increased oxygenation are directly related. Great medical article. I’m not a medical student but I’m interested with different medical practice. After I read your article, I think I have to study medicine.